Garlic is a prime source of vitamin B6. Vitamin B6 is a major requirement for efficient growth of new cells in human body and for a healthy immune system. Vitamin B6 assists with mood swings and improve cheery disposition. Vitamin B6 is a cancer fighting substance. That is why garlic is useful in prevention of multiple types of cancers. i.e Bladder cancer, prostate cancer, breast cancer, colon cancer and stomach cancer. Medical research has proven that tumors can be reduced when treated with garlic. Garlic is helpful in enhancing the level of insulin in the blood, this is why it can regulates the blood sugar. Doctors have suggested that garlic can assist in controlling the diabetes. Garlic clears acne. 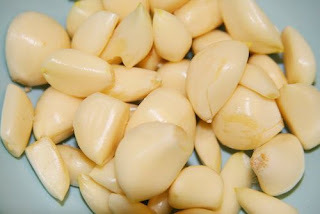 Garlic has a good amount of anti-oxidants, this is why it makes a great natural remedy to banish unsightly blemishes. Rubbing a sliced clove of garlic on the pimple is an effective topical treatment. Garlic can prevents and treats cold. As you know that Garlic is packed with anti-oxidant, it can prevent and cure cold. Having a Garlic tea or drinking a hot water with steep chopped or minced garlic in it can cure the cold. Adding a honey in it can improve taste. Control your weight with Garlic. Study of Nutritionist Cynthia Sass states that, having a rich garlic diet reduces your weight. She also have a suggestion for you “Try to cook with garlic daily for tasty and waist-friendly meals”. Keep away mosquitoes using Garlic. Even the scientists are clueless but the fact is mosquitoes do not like Garlic at all. One study has stated that centuries ago Indians have found that people who rubbed a garlicky concoction on their arms and legs weren’t bothered by the pesky buggers. To keep your self away from mosquitoes make a solution of garlic oil, petroleum jelly, and beeswax for a natural repellant or place cloves of garlic nearby. Garlic is helpful in keeping the bacterial and viral infections at bay. Due to its innate compounds, garlic can help keep both bacterial and viral infections at bay. Garlic stops bacterial, viral, fungal, yeast and worm infections from growing. Garlic can be a cure of many type of skin infections. Garlic has antibacterial and antiviral properties. Ajoene is a chemical compound available from garlic, this substance is used to treat fungal skin infections like ringworm. Garlic prevents the formation of blood clots inside the body. This benefit of Garlic is because of anti-clotting properties of ajoene. The fact is Garlic is great for people with heart ailments and those who suffering from stroke and other clotting disorders.